Location:.5 mile downstream from the Coburn humped parking lot. Wednesday’s fishing adventure ended with a flurry, as I landed four nice brown trout during a dense blue winged olive spinner fall. Unfortunately I endured a significant amount of dead time during the daytime hours despite beginning our quest for fish at 8AM. Jeff and I were hopeful that Thursday would be a different story. Since we slept at the Schafer Cottages in Millheim, we were conveniently positioned near the upper section of Penns Creek below Coburn, Pa., so we made that our starting point. We were encouraged by the cool 65 degree temperature and cloudy skies, as we parked in a gravel lot below Coburn, and then we crossed a narrow bridge and hiked a worn path on the north side of the stream for .5 mile. After moving away from the creek, the path eventually returned, and we took the first decent worn trail to the edge of the water. Penns Creek in this area consisted of long smooth pools with short faster glides and long pockets in between. I elected to test my dry/dropper technique, and I began my day with a yellow pool toy, emerald caddis pupa, and prince nymph. In 2003 Jeff and I visited this same segment of Penns Creek on a Saturday morning of Bucknell reunion weekend, and I enjoyed a bit of success on the emerald caddis pupa. I attempted to repeat my success, and added the prince nymph to cover the possibility of active isonychia nymphs in the area. Jeff and I enthusiastically covered the attractive water for 1.5 hours, but once again the central Pennsylvania limestone creek did not reward us for our efforts. I did manage a momentary connection with a medium sized brown trout, but that was the extent of our action. Our best catch was a bundle of five interlocking tippet spools that Jeff spotted on the bank as we moved downstream near the end of our morning venture. I inherited the windfall since Jeff favors brown tinted Maxima tippet for his leader sections. The temperature rose into the upper seventies, and neither of us were satisfied with our fishing prospects, so we decided to once again shift our focus to another central Pennsylvania stream at 9:30. Could we tolerate another fishless day with no reward for our persistent efforts? I was beginning to have doubts. Spring creeks in central Pennsylvania are characterized by placid flows with smooth glides over moss covered rounded boulders. Semi-clear deep milky green pools beckon an observant fisherman to execute long fluttering casts, if he or she can manage to avoid the dense canopy of green leaves that cast dark shadows over much of the stream. The wily brown trout reveal their presence with subtle sipping rises in out of the way corners of the limestone creek environment. In the absence of surface clues, fly fishing becomes a waiting game. A sudden appearance of an abundance of one or several aquatic insects shatters the calm, and frantic casting and hatch matching follow, and these are the electric moments that eastern fly fishermen savor and anticipate. Western fly fishing approaches follow the lead of the streams and rivers that begin in the high Rocky Mountains. These waterways typically rush toward their journey through the large agricultural valleys, and along the way they crash and churn over rocks and logs in a high speed race to the ocean. Whitewater, rapids and plunge pools frequent these rivers and creeks, and the fishing approach mirrors the high energy hydraulics of the targeted environment. Rather than calmly wait and observe in a manner similar to eastern counterparts, the western fly fisherman wades aggressively and casts often in an effort to present a variety of imitations to opportunistic fish. The western trout does not have the luxury of waiting for a dense hatch or to closely inspect its prey. The conveyor belt of food is set on high speed, and anything that looks alive and tasty is fair game. I was about to face the transition from the contrasting styles, as I anticipated my trip from Colorado to Pennsylvania. In preparation for my trip to Pennsylvania from May 27 through June 4 I reviewed my MFC fly box. 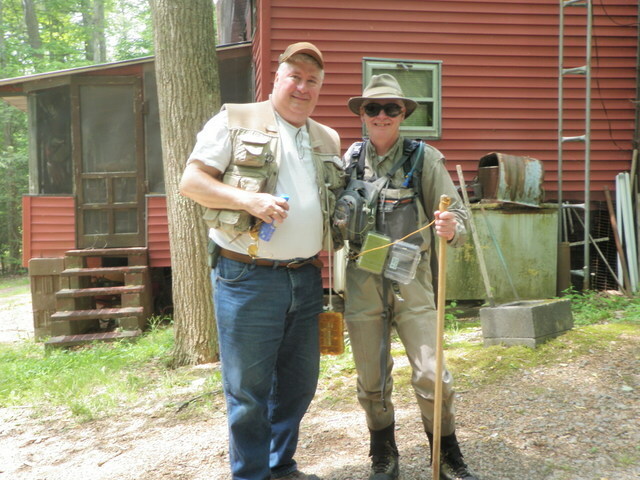 My Pennsylvania fishing friend Jeff informed me that the the green drakes and sulfurs were likely over, so I could probably look forward to isonychia, blue winged olives and golden stoneflies. I removed all my western green drakes to create space, and filled the vacant row with six isonychia comparaduns that I tied for a trip five years ago. I also added three isonychia spinners. Jeff promised to lend me some of his expertly constructed flies, but I felt an obligation to transport flies I tied myself to match the relevant insects projected to be present during my stay. Next I examined my fly box thoroughly, and I was surprised to discover a row that contained six size 14 dark olive comparaduns and another six size 14 medium olive spinners. 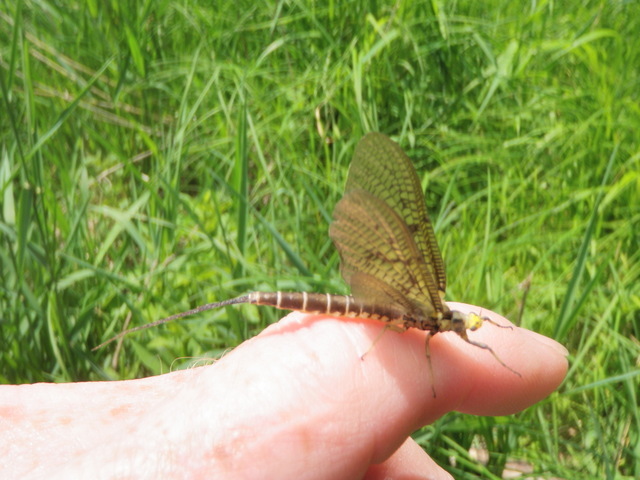 Why was I carrying these large blue winged olives designed for Pennsylvania mayflies on my Colorado ventures? I could not answer that question, but I was pleased to have them for the pending trip. Finally I checked for size 16 and 18 sulfur imitations in case we encountered stragglers, and I added a few more sulfur comparaduns from my boat box. On Tuesday evening after dinner at my sister’s house, Jane drove me to Whitehall, Pa. and dropped my off at my friend’s house. Jeff, being the perfect fishing buddy, had the minivan packed with food and fishing gear. We discussed a departure time for Wednesday morning, and given the forecast for hot and muggy conditions, we committed to a 4:30 start. Despite having a body clock that remained on mountain time, my excitement caused me to wake up before 4:30, and we were on the road by 4:45. This very early departure enabled us to be in the No Kill parking lot by 7:30, and subsequently we were on the water at 8AM. As Jeff texted me earlier in the week, Penns Creek was nearly ideal with flows of 270 cfs and a tinge of color that gave the cautious fisherman a bit of cover upon approaching attractive trout holding locations. Jeff is a veteran of Penns Creek and on a first name basis with many of the large denizens of the premier central Pennsylvania stream, so he stationed me in some prime spots and gave me first shot. I cannot overemphasize the generosity of my long term fishing buddy. 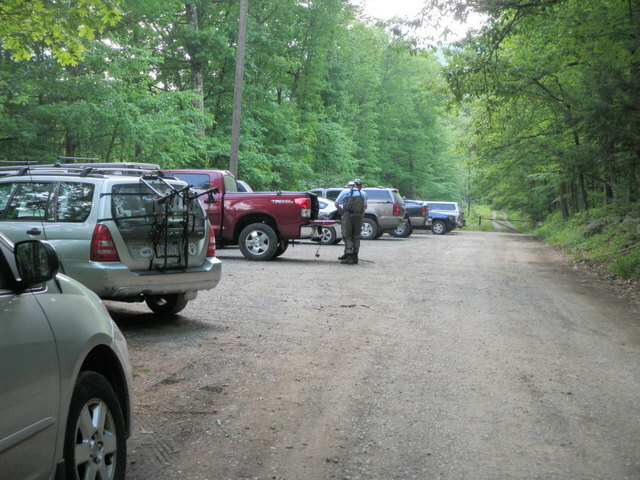 We tossed isonychia and golden stoneflies at Linden Tree, Willow Hole and Red Cabin Run; but the educated brown trout of Penns Creek were having none of our fake offerings. The air temperature warmed quickly, and the sky was mainly bright blue with only an occasional white cloud. Simply stated, the conditions were quite challenging, and two veteran fishermen were skunked despite a long morning of focused fishing. In one nice run of moderate depth I experimented with a dry/dropper approach. I tied a fat Albert to my line and trailed an ultra zug bug and beadhead hares ear, and this combination yielded two small creek chubs. I finally felt the tug of something on my line, but chubs were not what I was seeking in Pennsylvania. With the thermometer rapidly rising, Jeff and I decided to switch venues at noon. We drove to Millheim where we checked out the cottage that was reserved for Wednesday and Thursday night. From there we continued west and eventually headed south until we reached the upper stretches of Penns Creek at Spring Mills, where we crossed a bridge and parked in a vacant lot under some trees. The creek in this locale was a classic limestone spring creek with slightly milky flows and an abundance of thick aquatic vegetation. Jeff gave me first choice, so I elected the thirty yards of prime water below the bridge. Jeff jumped into the stream farther down at the end of a long deep pool where long branches displayed wide leaves and arched over the small stream. I was actually somewhat intimidated by the prospect of casting in these difficult conditions. As I studied the water, I spotted several sporadic rises, but when I gently cast a splash beetle, parachute ant, and Jake’s gulp beetle to the open lanes between the subsurface weeds, I received no response. I plopped my way along the edge until I was positioned at the downstream border of the bridge. I noticed three rising fish at the upstream section in the shadows, but these fish also ignored my presentation. I switched to a size 16 deer hair caddis for a bit, but it too was simply debris to be ignored to these smart Penns Creek trout. Jeff appeared on the bank below me, and he described a similar lack of success with extremely skittish fish in the warm humid afternoon conditions. Once again we packed our gear and made a move, and this time we transitioned to the section of water behind some cabins below the No Kill area. We were careful to stash our dinner in our backpacks, and I also remembered to carry a headlamp and my regular glasses in case we fished into darkness. We were hoping for an evening hatch, but we had no insight that such an event was probable. When we met the stream, we made a left and continued until we were beyond the last cabin, and here we began our quest to prevent a Penns Creek skunking. Since it was early, and I was not patient enough to wait for a rise or visible sign of a fish, I found some nice fast water that contained long pockets and deep narrow slots. I reverted to the dry/dropper approach with a fat Albert that contained a tan ice dub body. In addition I tied on a prince nymph to represent isonychia nymphs and the much favored beadhead hares ear nymph. It did not take long before I hooked a medium size fish on the hares ear, but it quickly wiggled free, and I uttered some unkind words while my skunking continued. Shortly after this frustration, I cast to the top of a relatively fast run, and I was shocked when a sizable Penns Creek brown trout utterly smashed the fat Albert. This fly was supposed to be my indicator, so what was going on? Unfortunately I played the brute for a couple minutes before it made a mad dash to the fast water. 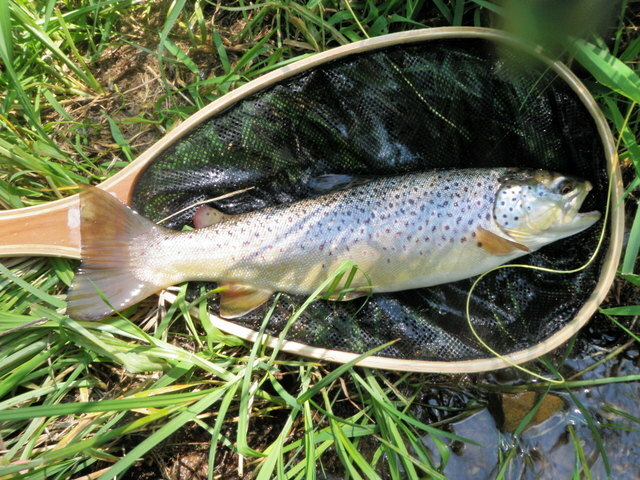 I was not in a good position to follow the fish downstream, and once again I must report on a long distance release. Unlike the previous incident, however, the larger brown broke off the fat Albert and the other two flies. Jeff observed my futile attempt to land the fat Albert eater, and he concluded that the trout took my attractor for a golden stonefly. My size 8 yellow foam imitation was larger than his creations, but he suggested that perhaps his were a bit undersized. 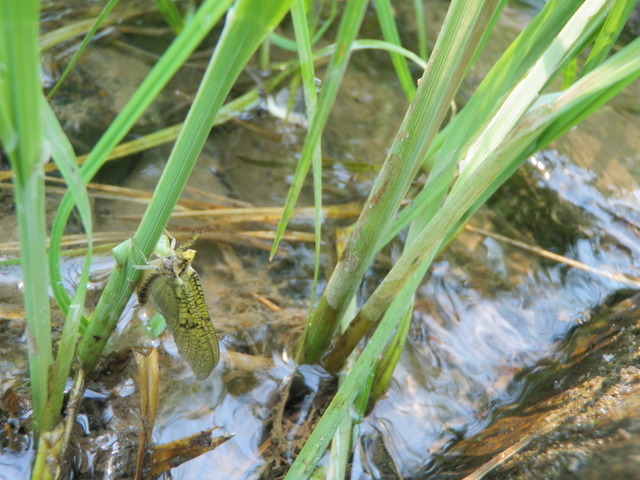 I actually saw two golden stoneflies on the creek, and one was much larger, so perhaps the big boys were in egg laying mode earlier than the smaller species. At any rate I did not have any more fat Alberts with a yellow body, so I switched to a size 8 pool toy with a light yellow dubbed body. Boom. It was not long before I endured another momentary hook up to the pool toy. This only confirmed that my hopper imitations seemed to be reasonable approximations of egg laying stoneflies. Unfortunately I was now zero for three, and my scorecard was blank. 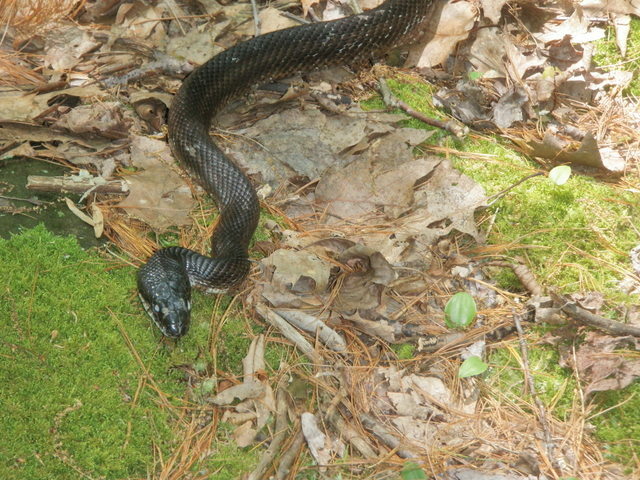 I moved farther upstream to the stair step area behind the cabins, and finally I connected with a twelve inch brown that gobbled the hares ear nymph. This fish was not a trophy, but I was appreciative of landing at least one shrewd Penns Creek brown trout. Next I approached a small eddy that Jeff recently abandoned. The location was just below the point of the long narrow island that separated the stream into two juicy channels. I flipped the pool toy into the nexus of the whirlpool, and in a matter of seconds a large mouth engulfed the buoyant hopper imitation. A tough fight ensued, but in this situation, I held the upper hand, as a strong fourteen inch brown trout nestled in my net. Another fish attacked one of my size eight hopper imitations perhaps mistaking it for an egg laying stonefly. I now crossed the left braid and walked along the bank to the upper faster section, where I prospected with the pool toy and dropper nymphs. I was brimming with a bit of confidence since the large foam hopper flies with yellow bodies yielded three hook ups with solid fish. As I worked a narrow deep slot next to an exposed boulder near the bank, I spotted several barely discernible rises in some fairly fast water. I made numerous drifts without success, so I went to the trouble of removing my dry/dropper flies and switched to a single isonychia comparadun. This fly also failed to generate interest, so I surrendered and moved to the next attractive space. The creek created a very wide gentle riffle in the area just above the left channel that flowed around the island. Surely the last hour of the day would cause hungry brown trout to spread out in these flats in search of easy meals. Just as this thought crossed my mind, several riseforms appeared fifteen feet above my position. I made some long casts with the isonychia with high expectations, but once again I was sorely disappointed. What should I do? I always carry a seine in an elastic pocket at the base of my net opening and rarely use it, but here was an obvious application. I stretched the seine over the net opening and held it in the creek in front of me for thirty seconds. When I extracted it from the water and peered closely, I discovered five or six crumpled olive-bodied spinners. It was now obvious what the feeding fish were tuned into. I went to my MFC fly box and extracted one of the six poly wing spinners that consumed space in my Colorado box for no obvious reason. I tied these six years ago in preparation for a similar trip to Penns Creek, but they never made it to the end of my line, since I did not encounter the elusive blue winged olive spinner fall. On this evening of June 1, however, I was very thankful for the presence of these archived flies. The fly possessed a deep olive body, dun hackle fiber tails, and white poly wings. The wings were kinked and splayed to each side in a curved style. The naturals in the water matched quite well except for the smooth flat wings that stretched at a ninety degree angle from the body. I was very concerned that my S shaped wings would be a deal breaker for the smart Penns Creek browns. Fortunately this was not the case. In the dwindling light between eight and nine o’clock I managed to hook and land four additional brown trout. All were quite nice specimens that measured in the thirteen to fifteen inch range. 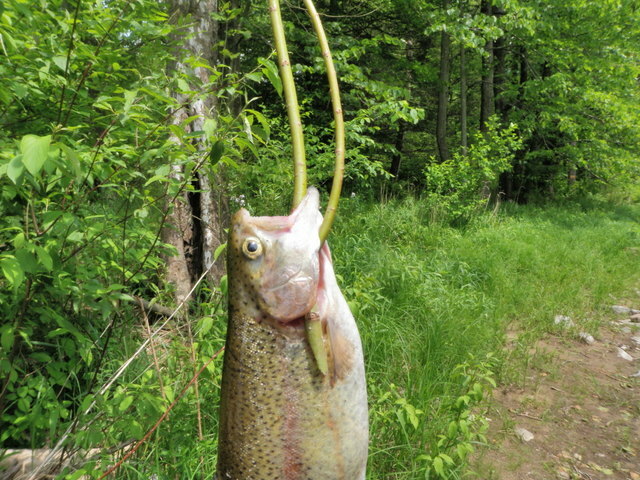 Two additional fish were hooked momentarily but managed to shed my heirloom tie. 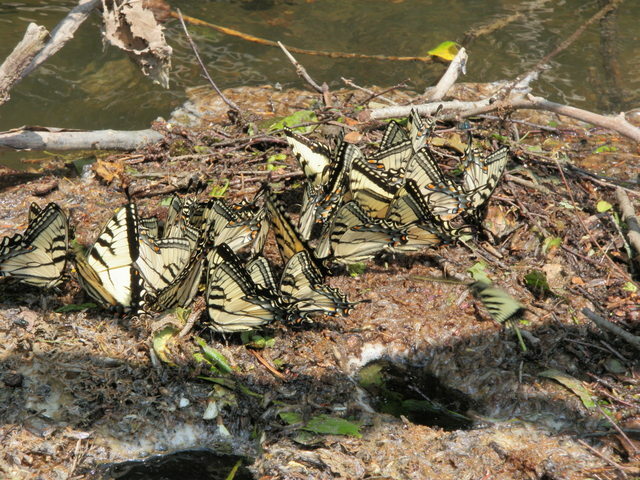 The magical spinner fall hour was the highlight of my trip, and I experienced the dense feeding frenzy that I hoped would commence. It was especially gratifying to pull an old fly out of my box that performed exactly as I hoped. By 9 o’clock the spinner fall ended and the feeding trout returned to their safe harbor holding spots. Jeff and I met above the island and carefully waded to the shore near the cabins and then walked back to his minivan. A night of rest beckoned us to our cottage, and I dreamed about two more days of eastern fishing. Would Friday repeat the exciting green drake day that we experienced on Thursday? The weather forecast called for another day of heat wave with highs of 92 and humidity. That certainly didn’t bode well nor did the fact that I was leaving at 4PM to return to Lewisburg for a cookout with some fraternity brothers. Jeff and I awoke at 6AM and hustled our belongings to the car and departed without showers (no hot water) to the no kill area of Penns Creek. The drive from Lewisburg to Weikert cost us 45 minutes, and with the hot conditions this was valuable time early in the day before the air and water heated up. We munched down some muffins in the parking lot, prepared to fish and hit the water by 8AM. We decided to circle downstream a bit and prospect some hot spots and then work our way upstream. Jeff was kind and let me have first casts on three quality spots. Inept casting in the first location caused me to hook a tree limb and then disturb the water. The second location was also a proven winner from past experience, and here I coaxed a rise to the green drake dun and set the hook. I was attached to a large fish that began to dive and shake its head. By applying side pressure I worked it back and forth and saw enough of it to know it was in the 15 – 20 inch range. Unfortunately after fighting the fish for a minute or so and just as I reached for my net, the fish made a quick turn and swam toward my legs. What was I to do? Should I put my legs together to block the fish and get bowled over at the start of the day? I allowed the big guy to swim between my legs and that was game over. The fly caught in my wader cuff and Mr. Brown escaped to fight another day. Knowing the sun and heat would probably produce difficult conditions only served to enhance my frustration and embarrassment at this turn of events. Jeff and I moved on to hotspot number three while I continued to mourn the loss of a nice fish. Number three did not yield any fish despite numerous drag free drifts cautiously lofted from a reasonable distance. Next we prospected some nice slicks and flats in a faster flowing stretch to no avail. Meanwhile there were remnant spinners from the night before as well as an occasional dun, but the surface did not contain the density of food that was present the previous evening or even what was witnessed in the morning. After some fruitless casting and observation we approached a nice deep pool from the left bank and Jeff spotted a rise within several feet of the high grass along the bank. He suggested that I cautiously work my way closer to the water and cast to the fish that showed its wherabouts. As I manuevered into position several additional fish rose and sipped an unidentifiable food from the surface. I began casting the green drake foam body dun to a fish that had risen several times, but my offering was being ignored. I switched to the positions of the other risers hoping they wouldn’t be as selective, but this didn’t improve my success. Meanwhile a fish rose higher in the pool and toward the right center, so Jeff positioned himself to fish to this new prospect. Periodic gusts of wind disturbed the tall grasses and leaves on the trees, and I observed numerous black ants on the wood logs that I was standing on. Could the fish be sipping these terrestrials in the slow moving pool? I brought in my green drake dun and added an eighteen inch length of tippet and then attached a parachute fur ant with an orange wing post. These two flies were quite visible as they drifted back toward me while I made multiple casts ten to fifteen feet across and above my position on the bank. I was covering the lane of the fish that had risen the most frequently. On perhaps the tenth drift a fish slid to the surface and sucked in the ant. I set the hook and battled a decent brown that appeared to be around 14 inches and quite husky. I was quite pleased to have coaxed a fish from this deep slow moving pool in the morning heat, and even more proud that I’d duped it with a trailing ant. Observation and adaptation did pay dividends in this instance. Jeff and I moved on and attempted to focus on the less obvious lies where fish might hide and try to sneak food on a hot clear day. Shade, cover and depth were the three key ingredients that seemed to yield opportunities. One such spot soon presented itself and Jeff once again gave me the pleasure of making the first attempt. As I prepared to cast I actually spotted a rise in a tight nook along the bank. I believe I still had the green drake dun and the trailing ant on my line at this point as I began methodically working my flies from the tail of the pool to the small eddy at the head. Near the lower end where the current ran along the bank a fish swirled at the green drake but did not take, so I had a refusal on my record. Eventually I delivered some nice casts to the edge of the current seam just above a bush that was hanging over the water, and on one of these drifts a fish assaulted the green drake. Again the battle was on, but this time I managed to overcome the valiant efforts of a sixteen inch brown. I photographed the silver warrior and returned it to the cold lair to fight another day. I caught up to Jeff and we continued on our way through several attractive areas as the sun reached its peak and beat down on us relentlessly. When we reached a long stretch of riffles and pocket water above a long pool I decided to add a beadhead prince dropper and prospect some juicy pockets and slots of ideal depth, but this yielded no takers so we moved on again. Just beyond this point we reached another nice pool and Jeff suggested that I climb a high bank and then descend back to the creek and cast downstream. Normally this approach is very difficult as the fish will see the fishermen above them, but this location was a small eddy and the fish faced downstream as insects drifted backwards along the bank. I was very stealthy and when I got in position above the eddy I noticed several nice gulping rises tight to a log against the bank. The sound had that hollow large fish ring that causes ones heartbeat to ratchet up a notch or two. I placed several casts in the vicinity but not tight to the log as I wished, but on the third or forth cast my leader sank and as I lifted to recast, the sunken leader sucked my fly under the water and into a subsurface tangle of sticks. I uttered a few choice words and stealthily tip toed along the edge of the bank to a point where I could dislodge my fly. I backed up slowly and retreated 5 – 10 feet and watched the water carefully. Much to my amazement a fish rose again but slightly further downstream and away from the log and bank. I made a few downstream casts with plenty of slack and allowed the green drake to drift over the point of the rise with no results, but on the third or fourth drift I saw a movement and sip and set the hook. Unfortunately the weight on my rod tip only lasted for a split second and the fish escaped. I surrendered to the cagy fish in the eddy and climbed back up the steep bank to a point slightly upstream and then crossed to meet Jeff on the other bank. We continued working upstream in the afternoon heat but the action was extremely slow. By three o’clock we were in a nice stretch of water with numerous shadows and the sun disappeared behind some small clouds occasionally. In one of these places Jeff made some precise long distance presentations and managed to coax a fish to the surface. He set the hook and found himself attached to an active brown that charged up and down the pool. 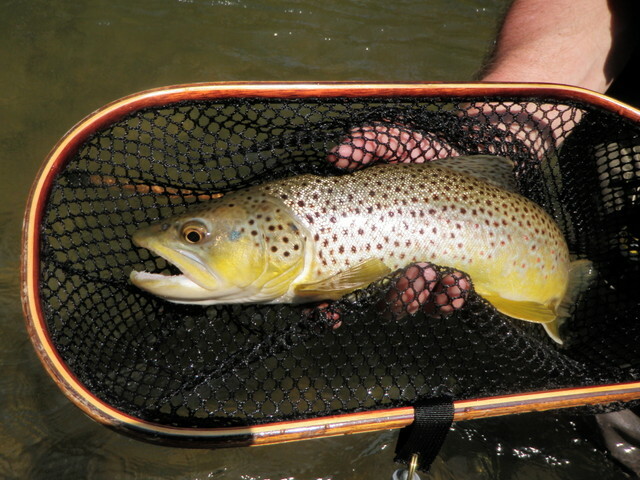 After a live demonstration of expert fish fighting techniques, Jeff scooped the brown into his net and sure enough he held another 17″ specimen. We moved on a bit further but it was now approaching 4PM and I did some mental arithmetic to determine I needed to begin the return hike so I could drive back to Lewisburg and perform my official registration and then shower and meet my friends by 6PM or shortly thereafter. We made the 45 minute hike down the railroad bed to the parking lot where I packed everything in the trunk of my rental car and said my goodbye to Jeff who planned to stay for the evening spinner fall again. I was totally fatigued from the hiking and heat and humidity, but I felt the satisfying glow of catching a few beautiful central Pennsylvania wild brown trout in one of the more challenging environments I’ve ever fished. My friend Jeff is truly an amazing fisherman who combines keen observation skills, ridiculously expert casting skills, and the patience and stealth to approach these educated trout. Added to these already advanced skills are his ability to examine insects and tie his own effective imitations that take fish under the most difficult selective conditions. 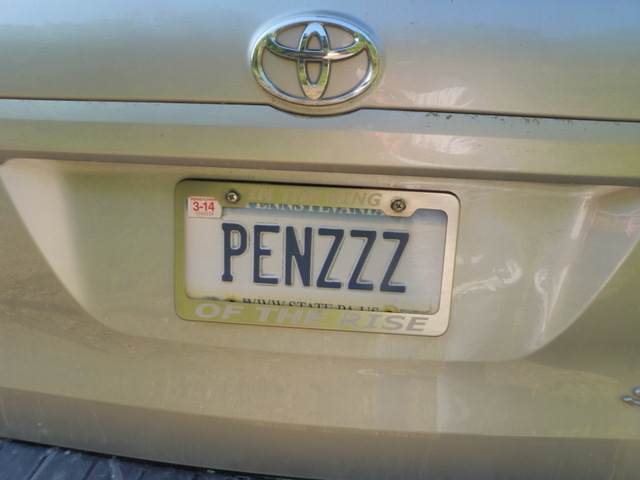 My hat is off to the person who displays a Penzzz license plate.